As I stated in my last blog post, I have been looking into solutions for ROO-207 "Allow in context creation of 1:n and 1:1 related objects". Well, I am happy to announce that I am getting there. What I have now can best be described as an early work-around. It's not a full solution, but rather a first kick at it. The direction I'm currently going with is to change as little of the look and feel of ROO as possible. To that end, I will leave the drop down list of related items for now. 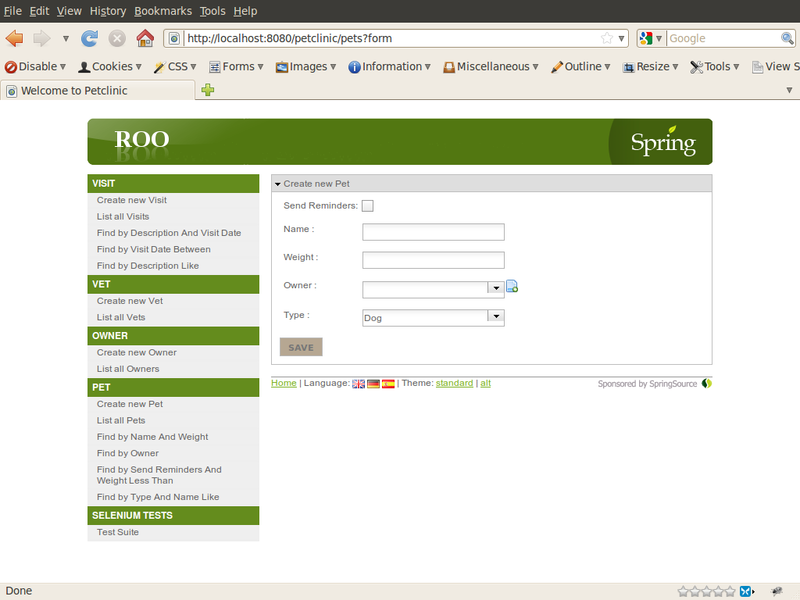 I am also using Dojo for this since it is already included by ROO. There is no validation on the dialog form. Since it is extremely manual, it is still very error prone. If you change anything on the referenced Object, you will have to change the create page for the host Object. We fetch the latest objects every time the referenced Object list is opened. This may be an un-acceptable performance hit. I'm publishing this work to gather the opinions of the community before going through the effort of turning this into a plugin. A picture says a thousand words... so here are a couple thousand words. Petclinic - Add Pet Add "Owner" from within "Add Pet" screen. This tag is based on the create.tagx in the same folder, but instead of a basic <form>, a modal dialog is created. ...and some others that just needed to be modified. Not absolutely necessary, but I added a "getName()" method so that the dropdown would display the full name of the owner. 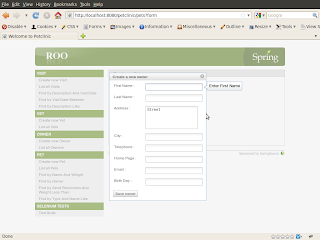 Modified to enable Dojo's "parseOnLoad"
Modified since the host form was not getting submitted while the referred form was on the page. Modified to accommodate the selective inline creation of Objects. Modified to support the disabling of form binding. Modified to include the Owner creation form. Enable JSON for the referenced objects. Copy the new and modified files. Modify the Create page for the host Objects. This last step has three sub-steps. 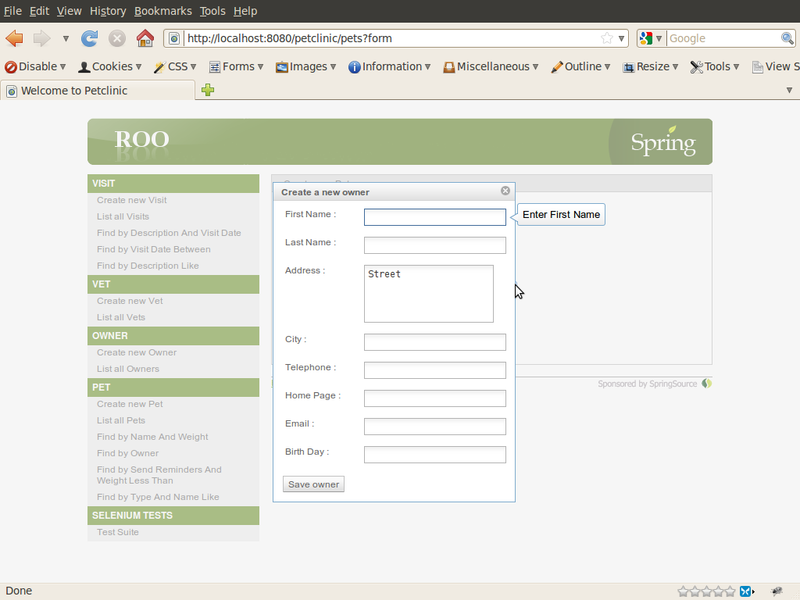 Again in our example, we want to create an Owner from within the page that we use to create a Pet. We will then modify it. I think the pulldown should be replace by a searchable list, possibly as part of popup kind of thing so that not all related objects are retrieved on parent object load. Mainly because in some situations, the number of child objects may be very large and pull downs can be very inconvenient for this. Although in most cases you would want to immediately see the contents of the set at parent level. Thanks for your feedback. I agree that there will often be times that the dropdown list will become un-manageable. I feel that this particular bug should be focused on the creation of referred objects from within the creation of their hosts. Once that functionality is implemented, the presentation of referred Objects can certainly be addressed. I don't think that there will ever be one approach that will satisfy everyones needs. Wow!!. You people really talented. Good work. Go ahead!